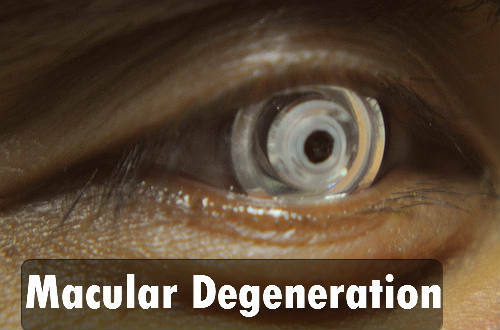 Macular degeneration is also known by the names of age related macular degeneration or senile macular degeneration. It is a rare kind of eye disease but now has become increasingly common. The disease is not curable but can be treated. A person is said to be affected by macular degeneration when the macular region of the retina in the eye is affected and forms central vision. The central vision is the vision in which we can see only the central part of what we see. The side and the upper and down parts of the vision will be distorted or no visible. The retina is the part of the eye which sends and transfers the light signals to and from the brain. The macular region is in charge of the vision of the eye, spotting the bird high in the air, recognizing colors and to thread a needle etc. The macular region is important for the 20/20 vision of the eye. Age related Macular degeneration is the primary cause of blindness in the USA. It has been estimated that about 2 million get affected by this disease every year. The record is expected to increase by the year 2020 to about more than 3 million a year. Before to proceed further, just read out 2 articles. One is Glaucoma – Causes, Symptoms and Treatments & What are cataracts? – Causes, Symptoms & Treatments . It is the most common form of macular degeneration affecting the eye. The individual affected by this will almost produce no symptoms but will be the characterized by the presence of small, round and yellow lines called drusen. These can be visible at the back of the back of the eye at the part of the retina by a powerful ophthalmoscope. These can be diagnosed by a person at the thirtieth age of his life. Advanced dry form of this macular degeneration is the most common reason for blindness in the people. The wet macular degeneration is more worse than the dry type. It results when the new blood vessels begin to grow under the retina. The blood vessels bleed, scar and transform the shape of the retina thus resulting in permanent vision loss. The wet type of this disease is not so common but it affects the vision of the persons who have crossed their seventy years of age. Age is the primary reason for people to be affected by this disease. The risks for the disease increases with the aging of the people. The whites are more prone to the diseases but it affects all races equally. It is more common in people with lighter tones of skin that is with low pigmentation. Individuals with lightly coloured iris are more vulnerable to this disease. People who smoke cigarettes have high risks of being affected by this disease. Metabolic syndrome and obese body conditions are also said to be the reasons for the macular degeneration. People with sleep apnea are more susceptible to be affected by the macular degeneration. Some medications also result in macular degeneration. Myopia also results in myopic degeneration. Genetic and hereditary factors are the most common causes for people to be affected by this disease. Increased exposure to sunlight results in the degeneration of the macular region of the retina in the eye. Hazy vision or blurred vision that makes the vision difficult for the person to focus the central and far objects. The symptoms normally will be not attended to by the victims because they only recognise the symptoms only after the good eye is affected. The occurrences of blind spots in the eye. The lights which are straight look crooked and the objects seem to be in different colours in each eyes. The objects may appear to be smaller in one eye rather the other. This leads to the brain to focus more on the affected eye and tends to ignore the vision of the good eye. Eye pain and vision loss may be the reasons for the macular degeneration. The treatment for the vision loss caused by macular degeneration is not effective but some medications have been proposed to be the cause for the degeneration of the macular region of the eye. Some people affected by dry macular degeneration were found to be with lack of antioxidants. The antioxidants like zinc, copper, vitamins A,B,C and E and selenium helps to restore the stability in the blood by eradicating the free radicals from the body. The macular degeneration is not formed with the absence of the harmful antioxidants. This treatment is used in the treatment of wet macular degeneration. These lasers dismantles the new blood vessels and the old blood vessels alike. The vision is impaired in that part of the eye where the laser beam was sent. The vision may be well restored in some cases. The drugs that obstruct the vascular endothelial growth factor (VEGF) are now scrutinized as an option. These drugs have shown good improvements in vision, other than than delaying or stopping the regular loss of vision of macular degeneration. A light drug by name verteporfin will be administered within the veins, and a medical laser shuts the abnormal vessels at the same time keeping the retina fit. Many treatments more than a period of two years are needed as shut blood vessels can be opened again. This is due to the fact that as Verteporfin is operated by light, subjection to sun’s light should be neglected for a week after therapy. This treatment is varied from basic Argon laser medications. The basic laser uses a thick ray of laser that covers the macula fully, but laser treatment of Argon gets exactly regulated by the optometrist to burn particular leaking vessels with the help of a biomicroscope. The Vascular Endothelial Growth Factor help in the growth of the new blood vessels. So in order to counteract that anti VEGF therapies are given to patients. This stops the blood vessels from growing. They are insoluble and are given as eye drops to the patients. They are sent into the eye with the help of a pars plana which is the place that has no blood vessels. Some people shrink back at the idea of inserting a needle at about 3mm below the cornea but it is the only way to sort the problem. Some medicines like Anecortave acetate can be used at the back of the eye to inject the medicine. The duration of this treatment is about six months and no exact quantity of the injection into the eye is not known. Pegaptanib is a medicine that helps to stabilize the vision of the eye. Other medicines like Avestin, Squalamine lactate, Ranimizumab and other some other additional therapies also help to totally neglect the problem of ocular damages. The surgeries are also suggested to people who have no chance of reversing the former healthy condition of their eye by laser treatment. The surgery produces no accurate vision gain but helps to prevent further vision loss in people.